What is a Paste Pump? Education Series and Common Questions Clients Have. In dredging, food manufacturing and industrial material processing, the term “paste pump” is generally used for categorizing the materials associated a slurry, paste and vicious material handling pumps. Paste Pump has been coming up in conversation recently with clients about updating and replacing their pumping systems. Paste definition reads as follows; a thick, soft, moist substance, usually produced by mixing dry ingredients with a liquid. This mixture is of a soft and malleable consistency. Paste, Slurry and Viscous material passes with ease. Many believe that the only way to pump paste is with positive displacement pumps. This is no longer the case with our new pump technology. EDDY Pump is neither a centrifugal pump, positive displacement pump or vortex pump. The EDDY Pump is instead a pump that harnesses the power of a tornado within fluid dynamics. Not only can our pump move paste, slurry and viscous material at higher rates than the competition, but it is also self-feeding, unlike positive displacement pumps. The EDDY Pump does not have an impeller, but instead a geometrically dimensioned rotor and volute that creates a perfectly synchronized EDDY current. (See Image) This EDDY current then creates a turbulent flow that allows the ability of the pump paste that is highly viscous in a turbid manner instead of the conventional laminar flow. The turbid flow decreases the viscosity as the paste is pumped, allowing higher flows. The EDDY Pump has been utilized on many industrial paste pumping projects with much success. Some of the most notable have been pumping red mud (residual of bauxite mining), high viscosity drilling mud, and fly ash. Red Mud from bauxite mining is one of the most viscous pastes to transport and usually requires positive displacement pumps. Utilizing the power of a 10-inch EDDY Pump, Rio Tinto pumped the red paste at levels measured around 40 percent solids and a viscosity of over 1000 centipoise. EDDY Pump successfully pumped over 500,000 cubic yards of the red mud paste, maintaining 1200 GPM with a pumping distance over 1.5 miles. To learn more about the exact pumps and dredge equipment used, read the full white paper HERE. Or call us. Fly Ash Paste pumping can be seen as a very difficult feat, but is becoming more and more of a necessity. The EDDY Pump is able to recirculate the fly ash as lime is being mixed with it, in order to create a homogenous solution. It is then able to pump this paste/slurry distance over 5 miles utilizing the same pumps. This saves the client a lot of money in having to mechanically mix the paste and then use pumps to transport. The EDDY Pump has also been used in many applications to dredge the fly ash paste from ponds and rivers. See the Fly Ash/Coal Ash paper HERE. EDDY Pump excels at high solids, abrasives, sludge, slurry, grit and extreme material. 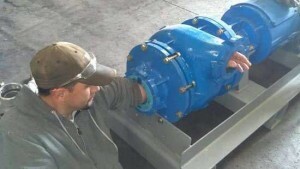 Other Applications: EDDY Pumps can be built in stainless and FDA food grade compliant. Watch our short video showing the EDDY Pump at work. Call with questions. We have a long history on US Navy Ships, industrial mining and with commercial food processing. Extreme solids and slurry pumps. Food safe pump materials available.